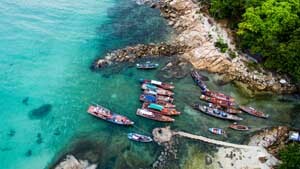 So you have heard quite a number of hoo-hahs about Koh Samui – the little Thai island that has been a tourists’ hotspot. A villa booked, flight tickets bought, you gather your gang, and everybody is ready for an exciting trip to the tropical paradise. Pristine coastlines, white sandy beaches and turquoise waters await you to come and enjoy. However, the paradise can become pretty dire if you are not able to navigate your way around, or are unaccustomed to the local’s ways. Being overpriced, getting lost and scammed are some of the unfortunate situations you may encounter. Fret not, here’s a little handy guide to help you prepare. Usually, this is one of the most popular options for tourists. It is fairly easy to flag down a cab and get to your desired destination. However, just a little heads-up, taxi drivers are known to be unwilling to use their meters, unlike in other countries. Sometimes, they will show you a list of “official” and “standardised” rates for trips between two attractions. However, these rates tend to be inflated. Furthermore, if you hop on a cab outside a popular spot, be mentally prepared that the price can be unreasonable. One way to avoid this is to walk a little further, away from attractions and hotels. You will be able to get a ride without paying an exorbitant rate. Another tip is to ask your villa or hotel staff for a general idea of the market rates to avoid being overpriced. Instead of getting on a taxi, you can opt for a motorbike taxi, a cheaper and more convenient option. This is more suitable if you are travelling alone and do not share the fee with your friends. The prices are negotiable before the ride, but travellers can be quoted a higher price, especially when you do not have an idea about the market rate. It is helpful to ask your hotel’s or villa’s staffs about the price. They may not be able to give you the most accurate price, but at least you have a rough idea on how you should negotiate. 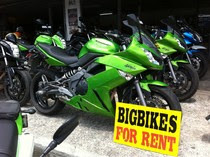 There are plenty of motorbike rental shops in Samui. If you are confident with your riding skill, renting one is a fun and convenient way to bimble around the island. The rental fee is fairly reasonable. Nonetheless, make sure that you rent from a reputable company. There have been incidents where companies rent out stolen motorbikes or demand a high compensation for the bike’s “scratches” and “damages”. To better protect yourself, make a thorough inspection before renting the bike. *If possible, take a picture of the bike’s state before you rent it. Make sure that any scratch or damage is written into the agreement. It is customary for the shops to keep your passport during the rental period. However, there have been some cases in which the passport is kept until a significant amount is paid. If you encounter such incident, it is best to rely on the tourist office to resolve the issue. If you are not familiar with scooters or motorbikes, but still want to zip around the island on two wheels, electric bikes are a good choice. For these bikes, you do not need an international license. However, do expect to leave a deposit or your passport to secure the rental. Electric bikes are also a fun way to explore the island. If you prefer to rent your own car, there are plenty of shops offering the service in Samui. However, the price tends to be on the high side, so this option is more suitable if you are travelling in a large group or have young children. The car can be picked up at dropped off that the airport or at various places on the island. If you stay in a villa, the villa manager can help to arrange a car and driver for you in advance. If you prefer to explore Samui streets on your own, they can also help you to rent a car. 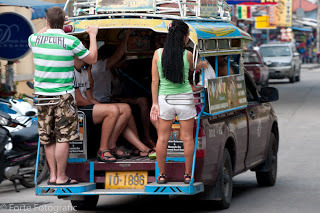 Songthaew, literally means “two rows” in Thai, is the so-called bus in Samui. It is the basis of the island’s public transportation. During the day, the songthaews, or pickup vans, follow a fixed route. There is no official station or drop-off point so passengers can get on and off the van anywhere along the route. Most songthaews travel along the Ring Road and northern and southern roads linking to the Ring Road. At night, these buses will turn into private taxis and can take you anywhere on the island. Do note that the fare will be higher than daytime. To Ang Thong Marine Park: book a tour or a private speed boat to the island. A little preparation goes a long way. With some prior knowledge about how to navigate around Koh Samui, you will not have to face “culture shocks” when visiting the island. All you have to do is sit back, relax, and let the waves and sand of the tropical island comfort you.